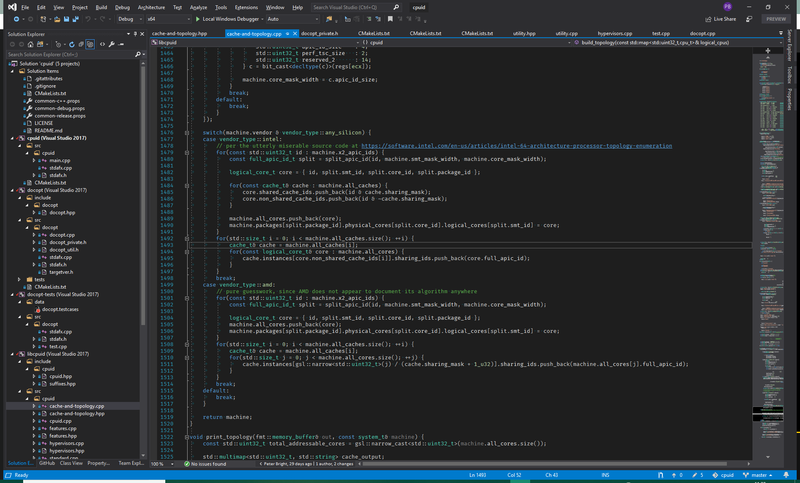 Enlarge / OK, so Visual Studio’s always gonna look like Visual Studio. But the eagle-eyed will spot a few differences. There’s the menus-in-title bar at the top. There’s the message “No issues found” in the status bar, showing that background code analysis has found no problems with my code. Bottom left, to the left of the “Ready” text, is the new background task status indicator that provides more information about things like scanning code to build IntelliSense information. There’s a (not visible) GitHub tab in the Solution Explorer panel that’s used for the new Pull Request integration. And, of course, there’s the Live Share button top right. A new version of Microsoft’s integrated development environment (IDE) goes live today with the release of Visual Studio 2019 and its cousin Visual Studio 2019 for Mac. Indeed, this iterative, incremental model is the one that Microsoft is pushing (and using) for services such as Azure DevOps and is comparable to the continuous development we see for Office 365, which is updated monthly, and the free and open source Visual Studio Code, which also has monthly iterations. With this development process in place, one wonders why we’d bother with “Visual Studio 2019” at all; let’s just have “Visual Studio” and keep on updating it forever.